In a small bowl, whisk the olive oil, lime juice, mirin, sesame oil, chile, and 1 tsp. salt. Prepare the noodles according to package directions, drain, and rinse with cold water. 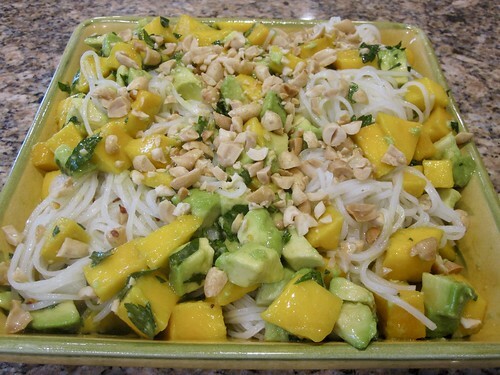 In a medium bowl, gently toss the avocados, mango, and basil with enough of the vinaigrette to coat lightly. In a large bowl, toss the noodles with enough of the remaining vinaigrette to moisten well. Serve the noodles topped with the avocado mixture, peanuts, and basil. Pass the lime wedges and any remaining vinaigrette at the table.